Drought has been a significant concern throughout much of the western U.S., threatening the livelihood of farmers and communities across several states. When years of drought stretch on, groundwater pumping often becomes the most viable option for the agriculture sector, leading to a negative water-balance and increasingly sparse water availability. Local water authorities are scrambling to recharge the groundwater supplies for their districts’ agricultural needs. 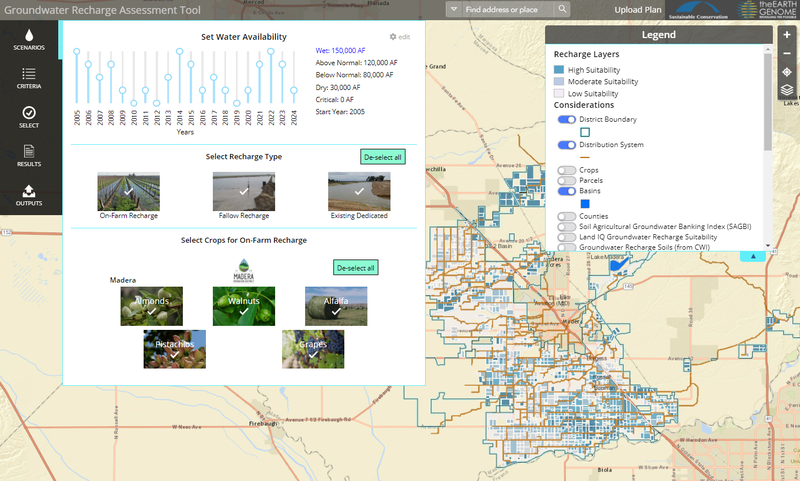 Fortunately, a new tool for their arsenal is now available – the Groundwater Recharge Assessment Tool (GRAT), developed in partnership with The Earth Genome and Sustainable Conservation. Through a prioritized use of dedicated recharge basins, fallow field recharge, and on-farm recharge sites, it may be possible to balance the water budget and reverse the damage caused by years of over-pumping. On-farm recharge is a relatively new approach and requires an understanding of what crops are being grown, and how flood-year waters could be applied during select weeks of the year when high-flow water is available. Currently much of that water runs off the landscape and eventually into the ocean, but on-farm recharge may provide the key to capturing that water by recharging underlying aquifers. 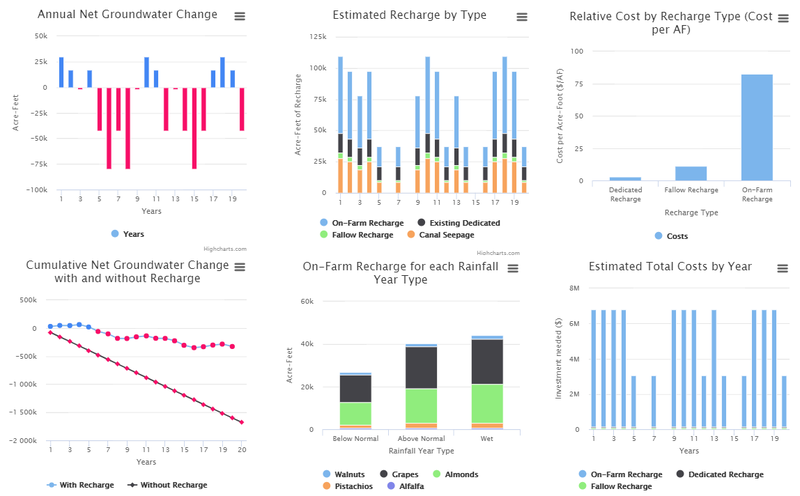 To calculate the best use of on-farm recharge and the impact on the water budget, GRAT allows irrigation districts to run an unlimited number of wet-year scenarios, ranking of field types based on soil and crop characteristics, and detailed cost calculations. Setting detailed criteria requirements helps to optimize the selection of sites based on an irrigation district’s individual needs. Weighted indexes are calculated dynamically using a number of geophysical variables linked to each criteria. GRAT allows the automated selection of sites up to a target recharge volume or cost ceiling, and then the manual removal or selection of additional sites based on local expert knowledge. Advanced, dynamic charting gives real-time updates of groundwater balance and estimated costs based on selected sites. Once the balance has been reached, the option to save the plan can be used to share results with decision makers throughout the district. GRAT was co-created in collaboration with Madera Irrigation District and Tulare Irrigation District. It is also now being rolled out to other interested Groundwater Sustainability Agencies (GSAs) in California, to support their Sustainable Groundwater Management Act (SGMA) reporting requirements.